Sculpts and redesigns the oval “V” shape of the jawline and chin area. Lifts and firms the entire face, neck and décolleté. Deeply hydrates the skin and smoothes fine lines. Water/Eau, C12-18 Acid Triglyceride, Synthetic Beeswax, Glycerin, Butylene Glycol, Dimethicone, Glyceryl Stearate SE, Behenyl Alcohol, Hydrolyzed Soy Protein, Hydrolyzed Wheat Gluten, Ceratonia Siliqua Gum, Hydrolyzed Myrtus Communis Leaf Extract, Sodium PCA, Magnesium PCA, Sodium Hyaluronate, Zinc PCA, Manganese PCA, Ascorbyl Palmitate, Ascorbic Acid, Citric Acid, Tocopherol, Phytosterols, Hydrogenated Lecithin, Cellulose Gum, Microcrystalline Cellulose, Glyceryl Stearate, Cetyl Alcohol, Ethylhexylglycerin, Mica, Caprylic/Capric Triglyceride, Stearyl Alcohol, PEG-20 Phytosterol, Xanthan Gum, Disodium EDTA, Tocopheryl Acetate, Polysorbate 60, Sorbitan Isostearate, Phenoxyethanol, Sodium Dextran Sulfate, PEG-8, Potassium Sorbate, Sorbic Acid, Hydroxyethyl Acrylate/Sodium Acryloyldimethyl Taurate Copolymer, Dimethicone/Vinyl Dimethicone Crosspolymer, Fragrance, CI 77891 (Titanium Dioxide), Benzyl Salicylate, Hydroxyisohexyl 3-Cyclohexane Carboxaldehyde, Hydroxycitronellal, Linalool, Coumarin. Water/Eau, Glycerin, Butylene Glycol, Ammonium Acryloyldimethyltaurate/VP Copolymer, Coenochloris Signiensin Extract, Ginkgo Biloba Leaf Extract, Hydrolyzed Soy Protein, Arginine/Lysine Polypeptide, Ceratonia Siliqua Gum, Ruscus Aculeatus Root Extract, Zinc PCA, Magnesium PCA, Sodium PCA, Hydrolyzed Wheat Gluten, Manganese PCA, Sodium Hydroxide, Lecithin, Maltodextrin, Sodium Dextran Sulfate, Biosaccharide Gum-1, Disodium EDTA, Ethylhexylglycerin, Chlorphenesin, PPG-26-Buteth-26, PEG-40 Hydrogenated Castor Oil, Potassium Sorbate, Sorbic Acid, Phenoxyethanol, Fragrance, Caramel, Citric Acid, Alcohol, Benzyl Salicylate, Hydroxyisohexyl 3-Cyclohexane Carboxaldehyde, Hydroxycitronellal, Linalool. V-SLIMMING COMPLEX: This powerful toning and slimming complex, comprised of two synergistic botanical extracts: gingko (Gingko biloba) and butcher broom (Ruscus aculeatus), activates microcirculation, helps stimulate tissue oxygenation and fight free-radicals, soothes the skin and drains it to fight water retention. SWISS SNOW ALGAE: This rejuvenating and protective active ingredient utilizes the latest anti-aging strategy of caloric restriction. Various studies have established a link between lower calorie intake and lifespan extension. By mimicking the effects of a “diet” on the skin, the extract of Swiss snow algae offers the benefits without the discomfort. COLLAGEN CHRONO-PROTECTOR: Preserving the integrity of collagen fibers, this polypeptide system limits the degree to which the collagen fibres become rigid. This is due to an anti-glycation effect that in turn preserves the elasticity and compactness of the tissues along the jaw line and under the chin. 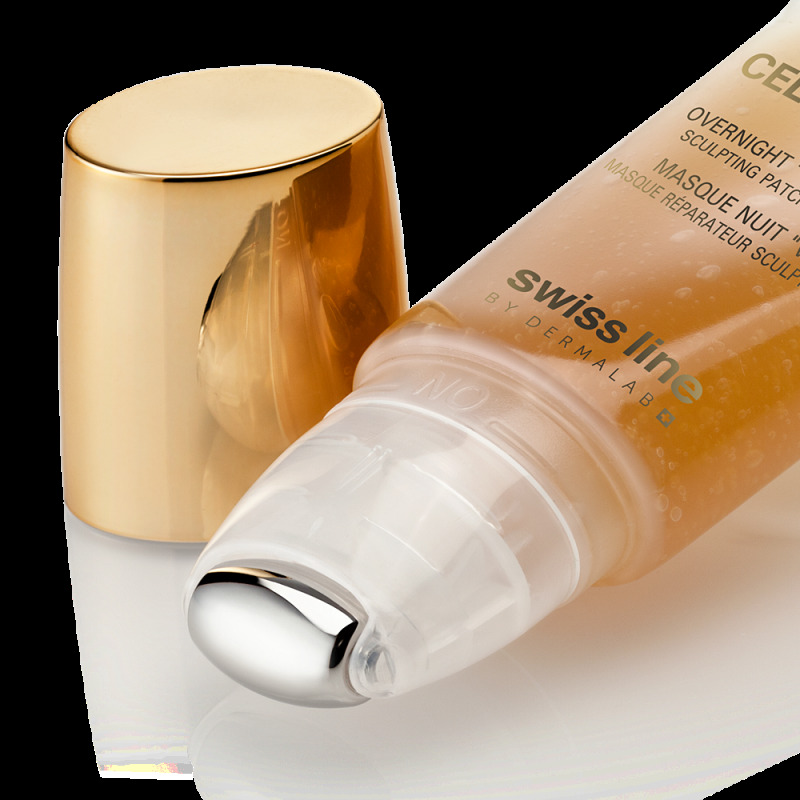 CELLACTEL 2 COMPLEX: Swiss line’s signature ingredient helps the skin cells breathe, preserve energy and metabolize more effectively, as it lifts and reduces lines and wrinkles. HYALURON-SKIN FILM: This film is comprised of sodium hyaluronate and liquid crystals. The hyaluronic acid helps preserve the most important characteristics of youthful, healthy skin, such as suppleness, elasticity and tone. A ”second skin” is produced to mimic/recreate the natural skin barrier. CELL LONGEVITY BOOSTER: Slowing down the expression of the senescence factors and limiting dermal degeneration, the Cell Longevity Booster has been shown to favor the synthesis of SIRT-1 proteins, involved in cell longevity. It significantly increases SIRT-1 proteins in controlled fibroblasts and restores them in senescent fibroblasts. 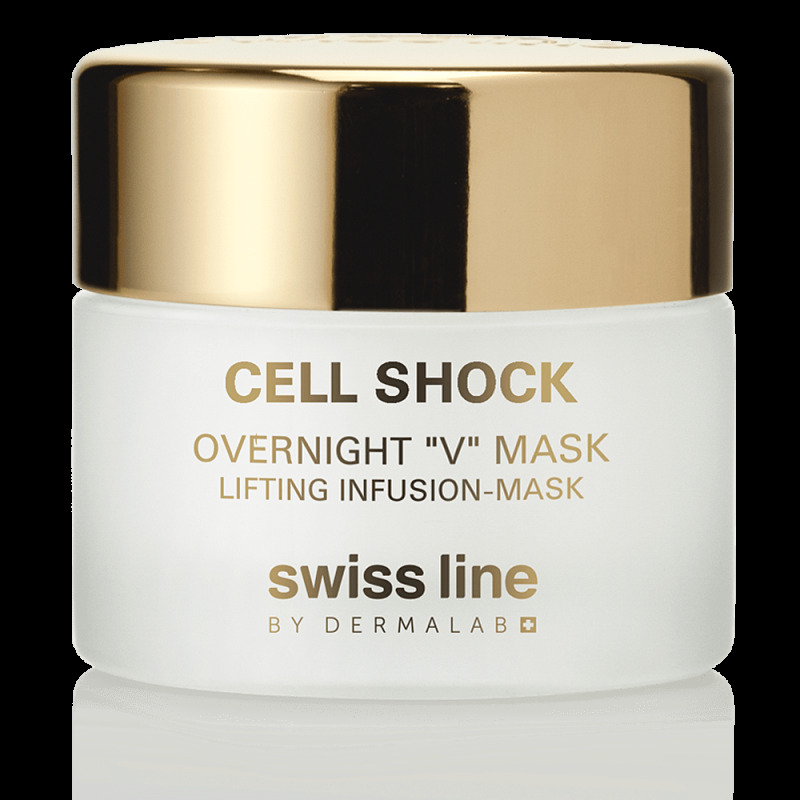 In vivo studies have shown that the Cell Longevity Booster significantly reduces the total number, surface and length of wrinkles. 89% of test participants had a reduction in the wrinkled surface of the crow’s feet after 56 days of continued application. OLIGO-CATALYST COMPLEX: Uniquely designed to respond to the nutritional needs of overtired, stressed skin, the Oligo-Catalyst Complex has the ability to stimulate cellular metabolism, boost the synthesis of intracellular ATP and increase cell growth. It is an optimized association between a physiological vector (“transporter”) and molecules of sodium, magnesium, zinc and manganese. Use the SCULPTING PATCH-MASK roll-on applicator to roll the product along the jaw line and under-chin areas as you apply a gentle pressure to the tube. Only a small amount of the product is needed as the gel forms a “patch”. 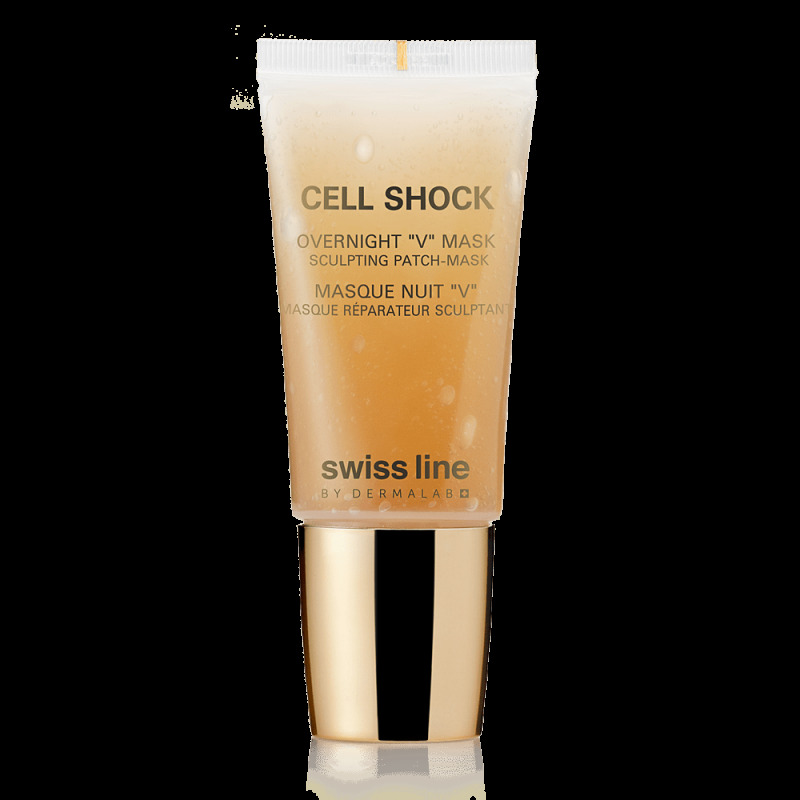 Smooth the gel with the fingertips as needed to even-out the application. The tube has an ON/OFF lock system. It should be kept in the OFF position at all times and only switched ON for application. Apply the LIFTING-INFUSION MASK over the entire face, neck and décolleté while making a soft draining massage with your hands. When removing the mask from the jar use circular movements with your fingers so as to “melt” and activate the second-skin film texture, thereby making the application of the mask even more enjoyable. Apply two to three times per week for an intensive action, or every night for as long as needed. I've been using the V-Mask for a little over 2 months now aprox 3 times a week. The V mask makes my skin feel silky smooth and moisturized. The Mask makes my skin look healthy and I will say it YOUNGER!! I definitely notice a nice glow in the morning and that can really make your day.... I feel if you use this product long term you will definitely see a lift and your face will definitely have a beautiful healthy glow. I am extremely happy with the effects so far and I will continue to use for years.. Using this product at night was very soothing and at times a stress reliever. The Packaging is a definite WOW! The application of the V Mask was such an easy process. I would definitely recommend the V Mask to all my friends and Family. I’m In Love with Swiss line! How do I combine the use of the V Mask with Perfect Profile Remodeling Cream? Our Perfect Profile Remodeling Cream is an everyday base product, that can be used on its own or before applying other products, day and / or night. Our Overnight “V” Mask is composed of two products that should be used together, once or twice a week. We do not recommend using Perfect Profile Remodeling Cream and Overnight “V” Mask together, instead use on alternative days. Do I need to remove the "V" mask after application? The OVERNIGHT “V” MASK belongs to a new generation of masks which work while you sleep, it should not be tissued-off or rinsed-off like a common mask. Can I apply the usual night cream after the mask, I have very dry skin? If you feel the need to apply your usual night cream on top of the mask you can do it, but this should only be done in the case of very dry skin conditions.